Massively popular body produced only by Kamtec Models. Will fit any 257mm wheelbase 190mm or 200mm chassis. Exclusively made by Kamtec Models in 2mm white ABS. No window masks or decals are supplied. 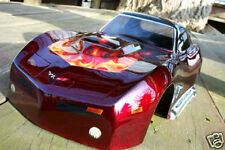 The body is a 63 Corvette Split-Window. 17" in length, approx 8-1/4" in front width, and approx. 8-3/4" in rear width. CONDITION: The body is in like new condition, and is in the original bag. 1/10 CORVETTE BODY SHELL. RC HELICOPTERS. RC SUBMARINES. RC TRUCK BODIES. RC CONSTRUCTION. RC CAR BODIES. RC ELECTRONICS. VERY NICE BODY, HIGH QUALITY FINISHED. The Traxxas 4-Tec 2.0 rolls out of the box pre-assembled with a factory-adjusted TQ™ 2.4GHz radio, XL-5 ESC, Titan 12-Turn 550 modified motor, and detailed instructions. Traxxas backs the 4-Tec 2.0 and all of our products with top-notch support that is second to none. rc TAMIYA vintage 2001 corvette C5, 1/10, TA04s.....NEW parts & RTR ! Uses a 4wd belt system.OK ?. a.TAMIYA TA04s. got a NEW-ish 2001 display item C5 corvette. of 27 T, & a used 5000 mah 7.2 NIMH battery. NEW 2.4 radio & receiver, NEW stinger racing motor. 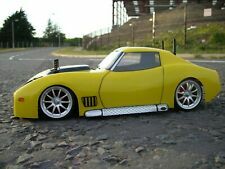 1997 vintage KYOSHO new build > c4 CORVETTE, 2wd...... SWEET../ RTR ! Also have a C5 corvette of tamiya listed. & in progress. > DONE. a 1997 era, NEW in box. & built chassis. mounted to chassis. mirrors, wipers on. Up for sale a Very Rare original Tamiya 1/10 R/C Corvette C5-R Racing TA04-S Belts Drive 4WD model number 58272 with ESC Transmitter. This is a Tamiya finished body edition, it is almost like new condition, included Futaba 2ch T2PH transmitter, Futaba receiver, Futaba S3003 servo,Tamiya TEU101BK ESC and upgrade motor. A forward and reverse ESC allow this RC car Drift to back out trouble so the drifting fun can continue. CORVETTE C6 BLUE. WE HAVE DRIFT OR TOURING TIRE. Motor Type - Electric Brushed 27T 540. Transmission - Forward and Reverse. Brushless & 3s lipo. BUILT item is complete & is RTR or show. .OK. of USA 1 chassis of nitro, i convert to. FREE Trial! ASK.?. BIAS 3S lipo, 11.1 volt. 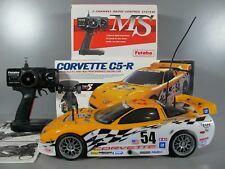 Up for sale a Rare New in Open Box Tamiya 1/10 R/C Corvette C5-R Finished Body TA04-S Belt Drive 4WD #58272. Tamiya presents a pre-painted realistic Corvette C5-R body included in the TA04-S chassis kit. The all-new 4-Tec 2.0 VXL chassis provides the ultimate high speed driving experience. The modular interlocking design allows easy maintenance while providing unprecedented rigidity and tight tolerances. Up for sale a New Sealed Rare Tamiya 1/10 R/C Corvette C5-R Finished Body TA04-S Belt Drive 4WD #58272. Tamiya presents a pre-painted realistic Corvette C5-R body included in the TA04-S chassis kit. 1988 1/10 Kyosho 1/10 Hi-Rider Corvette New In Box. 100% Complete everything is sealed. TAMIYA 1/10 CHEVY CORVETTE PACE CAR. chassis-compatible with a variety of Tamiya Option Parts. RC HELICOPTERS. RC SUBMARINES. RC TRUCK BODIES. RC CONSTRUCTION. RC CAR BODIES. AXIAL UPGRADES. RC TRUCK BODIES. RC CAR BODIES. RC HELICOPTERS. RC SUBMARINES. RC CONSTRUCTION. FOR 1/10 CORVETTE BODY SHELL. RC ELECTRONICS. FRONT AND REAR INCLUDED. CHEVROLET CORVETTE. Transmission Forward and Reverse. System 4 Drive Wheel Drive. 540 27T Brushed Motor Type Electric. Ground Clearance4.5mm.